Photo sourced from U.S. Federal Court of Appeals. 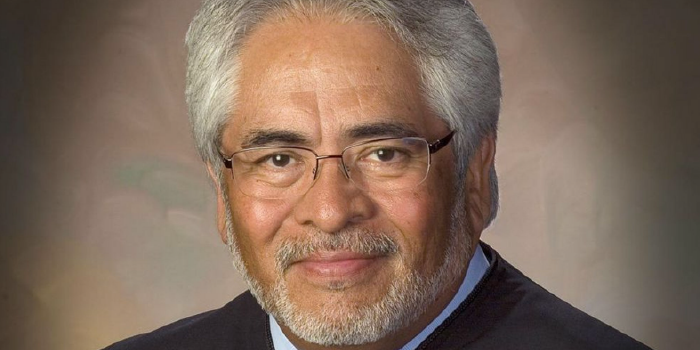 Judge Reyna, who is the first Latino to ever serve the U.S. Court of Appeals for the Federal Circuit, was appointed by President Barack Obama in 2011. Prior to joining the bench, Judge Reyna was a partner at the Washington, D.C. office of Williams Mullen, where he directed the firm’s Trade and Customs Practice Group, according to his court biography. In addition to settling trade disputes under the North American Free Trade Agreement (NAFTA), he also led the firm’s Latin American Task Force and served on their board of directors. Judge Reyna also helped found the U.S. Mexico-Law Institute and formerly served as the national president of the Hispanic National Bar Association (HNBA). He is the author of two books and numerous articles on complex international trade and customs issues. Judge Reyna is well decorated for his contributions to the legal profession, having been recognized as one of the nation’s 100 most influential Latino Leaders by Hispanic Business Magazine. In 2009, he was awarded the Ohtli Award—the highest honor that the Mexican government bestows on non-Mexican citizens. Hanna Monson, a third-year JD student on the “Conversation With” committee, will interview Judge Reyna in a conversation-style format. The “Conversation With” series, which began in 1999 under the leadership of Professor Emeritus Charley Rose, brings professional role models of the highest caliber to the law school, so they can share stories of their life and the law with students. In it’s 20-year history, “Conversation With” interviews have included Supreme Court Justices Ruth Bader Ginsburg and Clarence Thomas; Robert Ehrlich, former U.S. Congressman and governor of Maryland; New York Times columnist Anthony Lewis; former COO of the Peace Corps Thomas Tighe. Sherrilyn Ifill, president and director-counsel of the National Association for the Advancement of Colored People (NAACP LDF)’s Legal Defense and Educational Fund, joined the “Conversation With” committee most recently in 2018.